We unpacked who Arcimoto is, where it came from, and where it’s headed in an earlier article, and also showed off some beautiful pics of its latest creation, so let’s take a few minutes to get into the meat of the topic — the Arcimoto SRK. The SRK came to life through a very intentionally mapped out iterative design process that’s very similar to the software development methodology known as agile development. The goal of the process was to quickly (and affordably) develop a simple base model at the lowest price possible while ensuring the highest quality throughout the process. Tying back to his software development roots, Arcimoto founder Mark Frohnmayer was focused on building the minimum viable product (MVP) and getting it out there in front of people — both virtually and physically — to get feedback that has been leveraged to improve the product. Prototypes have been built for some iterations of the design process, as they allow for much more tangible, real-life testing and feedback. Why build “virtual EVs” for so many years before moving to production? It may seem counterintuitive, as it seems like turning millions of dollars of R&D spending into a viable product that brings in revenue as quickly as possible would be the best bet. However, in the automotive industry, costs are heavily loaded towards production, with ~95% of the total cost being spent on production and a measly 5% going towards design. This imbalance puts a bright spotlight on exactly why Arcimoto is investing so much time and energy into getting the design as close to perfect as possible before moving into production. Most companies build a final product and only hear from their customers after the company has committed to the full production cost. Think about the Chevy Bolt and how it was revealed while already in essentially the final production version without any opportunity for public feedback. Arcimoto is hoping to hedge off the possibility of a poorly received vehicle by intelligently investing up front in the hopes that the more thorough, more public process will result in a fully vetted product that has undergone years of scrutiny before ever moving to production. That could be a huge advantage that Arcimoto hopes to leverage over the next few years as the vehicle moves into production. The version of the SRK we drove is version #8 and is not quite the final production version, but the team believes it is close to tying up the last few outstanding items before moving the vehicle into production. 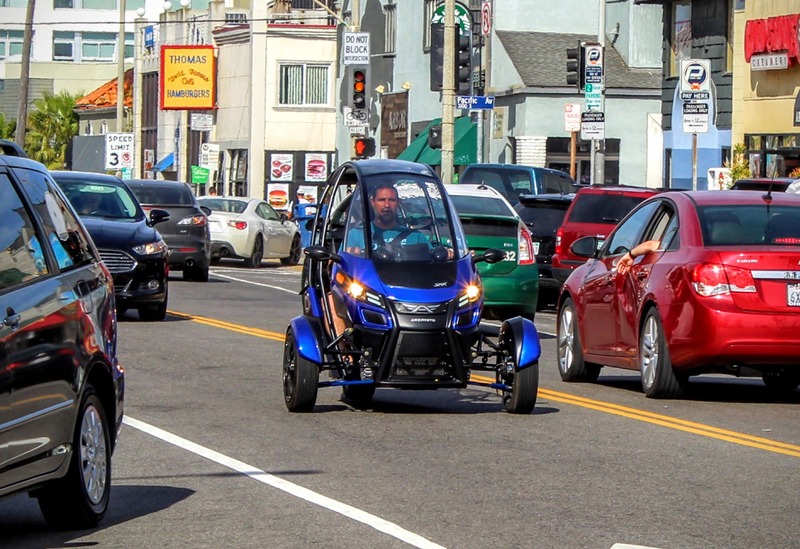 Arcimoto believes autonomous vehicles should be small & efficient vehicles, and the SRK fits the bill perfectly. Why automate the driving piece of the car without optimizing the physical space within the car? Using a smaller autonomous vehicle saves energy, increases parking density, and requires less material to build. Step 2 → Make the thing drive itself and bring the Autonomous SRK to market. Arcimoto hopes to have the first autonomous SRK on the road by the end of 2016. This doesn’t mean you’ll be able to buy it at that point … but it will be far enough along to be out mingling with the rest of us on the road. The vehicle itself was designed to be much simpler than a car in just about every way. This is partially due to the fact that it’s an electric vehicle and the electric drivetrain is inherently much simpler than those used in cars, but also as a result of the fundamental design strategy that was used. Most cars are way overbuilt for what they do, with most cars on the freeway only carrying one or maybe two people, yet built to carry four, five … even upwards of seven people in some passenger vehicles. 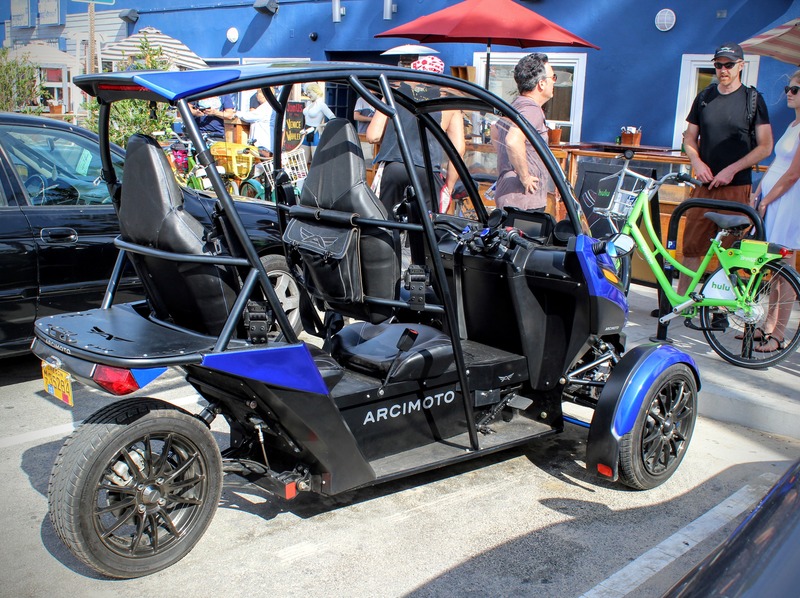 Arcimoto intentionally built the SRK to be simple, efficient, and optimized to move one or two people around. One design question that many EV enthusiasts are sure to ask about is the grille. The current grille on the SRK looks a lot like a cute version of Darth Vader’s mask, and unlike on many EVs, the grille is actually functional, as it allows for airflow to a radiator for the on-board power electronics. Net — the grill on the SRK is here to stay, though it may take on a slightly altered form in the production version. One reason the grille might change is the likely addition of a bumper in the production version. Bumpers can reduce damage at low speeds and improve the results in the event of an accident. It would likely extend 3–4 inches from the current nose and help with curb finding and other intended and unintended front-end activities. As you can see in the full photo essay we posted a few days back, the SRK has a conversation mirror to allow for more engagement with rear passenger. This is a neat little feature that helps bridge any potential awkwardness from riding front/rear vs the conventional in-car experience of side by side seating. Mark and I chatted while we drove around Venice and it was effortless and felt very natural. 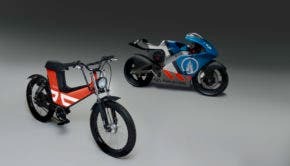 The current prototype of the SRK has been tuned down and is only running at around 60% power vs the production version. This is limited by throughput from the battery on purpose to allow test drivers to experience the vehicle at safe speeds, with a safer throttle response that’s less likely to result in a loss of control. The production-version throttle response will be more snappy with more torque off the line. Even with the reduced power, the SRK didn’t feel like a typical scooter. It felt like driving a car that had handlebars from a scooter or motorcycle dropped in. I attribute this to the two wheels up front that give the SRK much more stability. The size and supplier of the battery pack on the SRK have not been finalized, with the prototype rocking a 15 kWh pack. As with all motorcycles, safety is not formally rated, but the SRK seems like an extremely safe option when compared to most motorcycles, as it has a roll cage over top. Also, motorcycle riders are typically fully exposed, whereas the SRK is enclosed with a three-wheel design which provides more side-collision protection. Think about it like your own triangle of safety. Having said that, Arcimoto is having some of the critical items in the vehicle safety tested by a large engineering firm to confirm a few specific scenarios for the critical safety components — though, there are no plans to do destructive testing with the full crash test dummy setup. With the base SRK product designed to meet most needs, there will also be a variety of options for the vehicle to allow buyers to customize it to meet their needs. Some will be built in-house (like doors) but the plan is to foster an active community of aftermarket developers to bridge the gap between the production version and the needs of the customers. To make it easier for aftermarket developers to jump in, Arcimoto will make the “hard points” for the SRK available. These are essentially the hardware equivalent of a software API (application program interface) that detail the critical tie-in points on the vehicle for aftermarket developers. In addition, Arcimoto is planning to open source key components of the electronics that they found to be missing in the EV space that it can offer to the world. Arcimoto understandably isn’t racking up hundreds of thousands of reservations like some other manufacturers, but it is taking reservations. A simple $100 refundable deposit lets the team know that buyers are serious enough to pony up some cash, and with this system, they have racked up 800 to date. 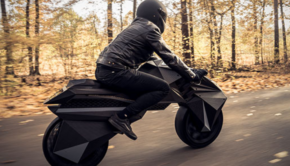 The SRK is a promising platform for personal transportation and is an EV we will be keeping a close eye on as it moves into production later this year. Stay tuned for the final piece in our dive into the Arcimoto SRK, where I will review version #8 of the vehicle.